There are few industries facing more regulatory scrutiny than the financial sector, much of which covers data security. With hefty fines, strategic and operational impacts, and exposure to legal action, failure to adequately protect sensitive information routinely costs organizations millions. 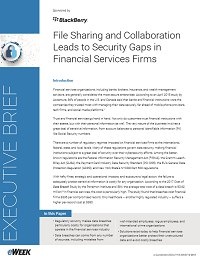 In File Sharing and Collaboration Leads to Security Gaps in Financial Services Firms, we explore the top sources of data breaches and cybersecurity threats. We then cover the solutions that exist today to help financial services organizations better protect their unstructured data and avoid costly breaches. Download your executive brief today.